How to distribute your flipbook to CD for offline reading? Can I use your software to publish flipbook and distribute it in CD for offline reading? And can I sell the CD? You can use A-PDF Flipbook Maker to convert PDF files to page flipping books and in the meanwhile, you can burn the books to CDs for distributing or selling. And your audience can read your flipbooks without networks. Create a new book project and browse a PDF file to import. Now after you finish importing the PDF file, you will be directed to the Design interface where you can customize the flip book with various settings: template, theme, background, scene, feature buttons, background sound, color, icons and so on. 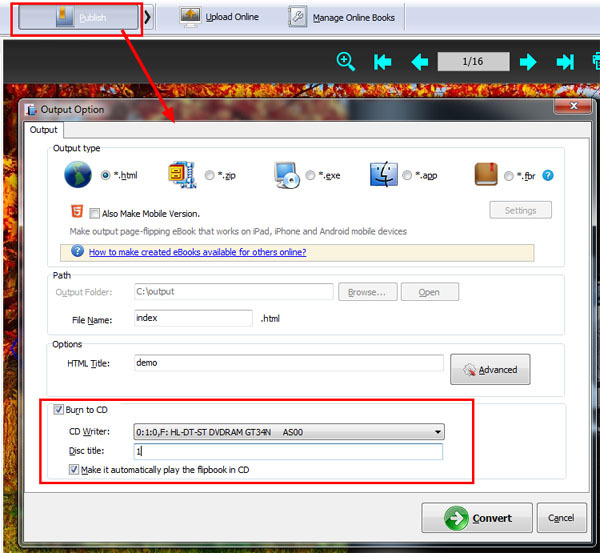 Click "Publish" and select a format, and select "Burn to CD" option at the bottom, select a CD Writer, define disc title and choose to enable "Auto Play" or not. At last, click "Convert" to burn the flipbook to CD.